Have a September or Fall Break beach trip planned? We have some beach goodies you simply can't live without! Spikers have officially arrived at The Pink Giraffe! You tote them along with you to the beach, shove them in the sand and they hold your cocktail/beer/water while you lay back and catch some rays! Available in several colors. These are great for bachelorette beach trips as little happy gifts for the bridesmaids! These bandeau tops are a must have for your beach trip! Lots of colors to choose from, and we love to match the monogram color to some bikini bottoms you already have in your closet! And of course you'll need something to tote all of your beach knick knacks in! With magazines, sunscreen, a great novel, water (or something a little stronger), sunglasses, a towel and snacks you certainly can't go without a monogrammed beach bag! We love this coral print one! Need something to pack in? Our ever popular Monogrammed Navy Trim Duffle is the perfect size for a long weekend trip! Christmas will be here before you know it!! We are already counting down the days (167 to be exact). Why not get your monogrammed shopping out of the way now? As a boost to get started on your holiday shopping, use code COUNTDOWN at checkout for free shipping on any size order (through Sunday Aug.23)!! How sweet are these holiday outfits? Happy shopping!!! Since it's been a minute or two sine we have blogged, we felt the need to share some of our newly added items!! 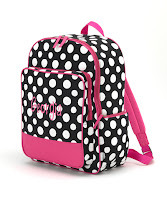 Back to school is upon us, but just in case you are still in need of a new backpack and lunchbox for your student, we have many to choose from! And some are even in our flash sale section at deeply discounted prices! 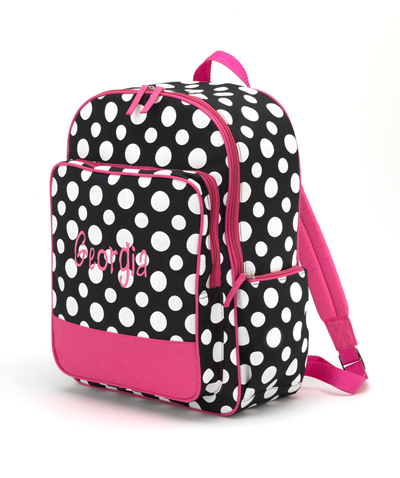 These backpacks and lunchboxes are the perfect, must have item for back to school, and at these prices, we don't know how much longer they will last! Get yours today! In need of a unique, keepsake baby gift? These monogrammed baby quilts are the perfect gift for a new baby boy or girl! 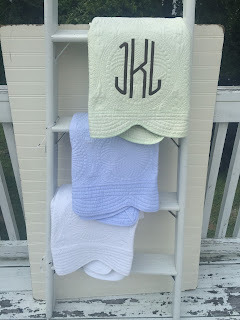 Available in white, blue, green and pink with an oversized monogram, these make a fabulous shower gift. Need something just for you? 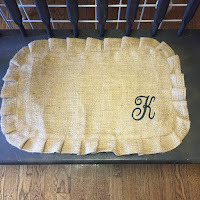 Burlap is one of our hottest sellers right now and adds Southern charm and flair to any home! We love these new burlap place mats to fancify your table! 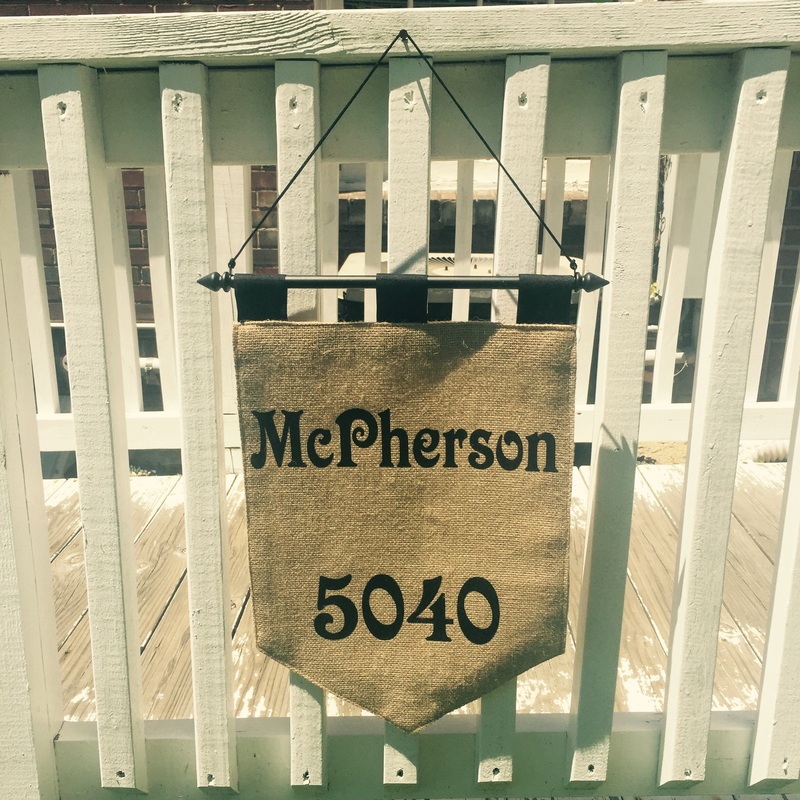 Or the house number flags to add some personalization and warmth to the exterior of your home. These also make fabulous wedding or housewarming gifts and are fully customizable! It is getting close to that time of year again, when the influx of graduation invitations in the snail mail will begin. 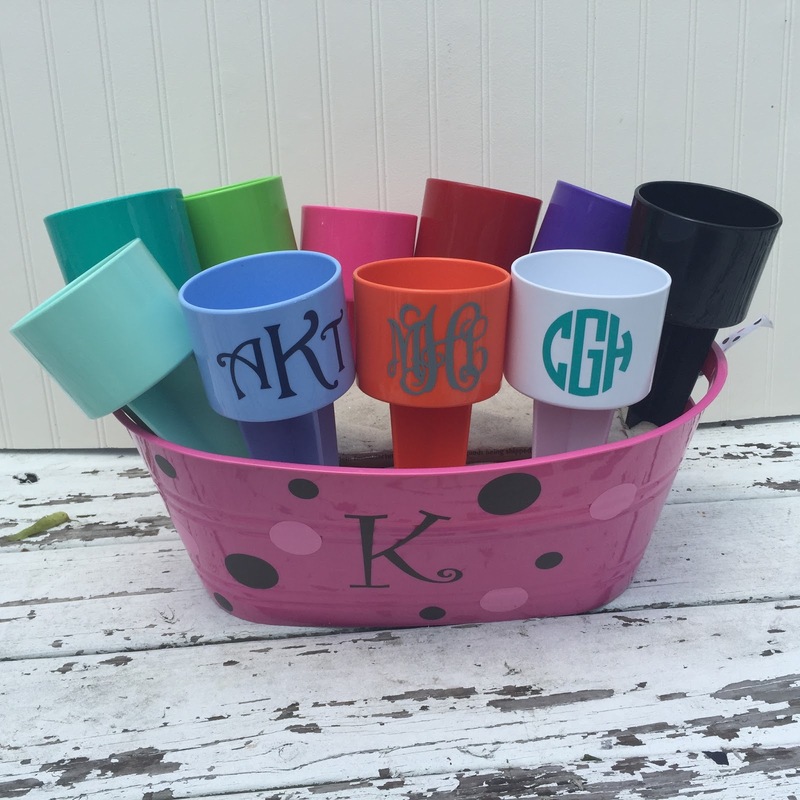 Don't panic about choosing just the right monogrammed graduation gifts this year, because the staff at The Pink Giraffe have assembled a list of our favorite grad gifts that have been long standing best sellers for us for quite some time. Choosing to add a monogram or initials to a gift for a boy or girl graduating from high school or college is the perfect way to show that not only did you put great thought into purchasing the gift, but is also very helpful in keeping up with those useful items in the dorm room and around campus. 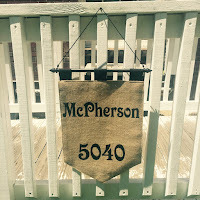 Help them keep all of their laundry in one place with an embroidered laundry bag with his or her name. Whether they are bringing it to the campus laundromat or home for the weekend, it proves to be a helpful tool for keeping all those dirty clothes in one place. 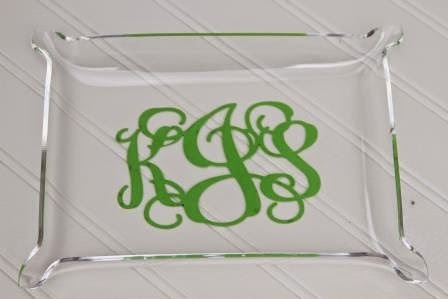 A monogrammed acrylic catchall tray or popularly referred to as Lucite as well , is just right for keeping little items organized and all in once place. Decorated with her initials in your choice of vinyl color and font, these durable trays are a classic staple for dorm rooms and apartments alike. She will love to have that personal spot to keep up with keys and a smartphone all in one convenient spot. The curved edges make it a perfect option for holding jewelry. Maybe chose to give her an embroidered make up bag that can keep all of her lipsticks and powders in one convenient place. 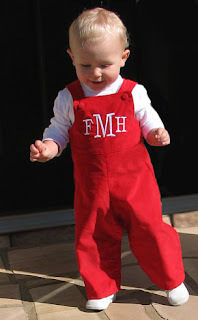 Embroidered initials on the side makes a beautiful personalized impression. 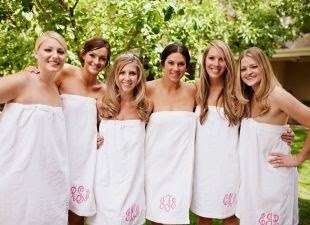 Our very best selling personalized graduation gift for girls has always been our monogrammed shower wrap for years. Girls adore the Velcro closure at the top and the luxurious feel of the elegant terry cloth. Our wraps are a far superior blend that has made them a favorite with our customers year after year. Give it a special touch by designing her monogram in the colors of her university or college. She will love to sport preppy style even in the dorm. Make that trip to the dorm showers easier with custom designed monogrammed flip flops. She will love them for showers as well as the beach. Add a matching beach towel in your own design to complete the set. She will love them at the pool or beach as well as just laying out in the sun on campus with her friends. Tech accessories make learning that much more fun. Maybe choose to give her a custom designed iPad case or cover and a matching monogrammed phone case to go with it? What a fun gift that will be showcased each and every time she uses her phone or tablet. The fun part about designing our tech cases is that you can use any color scheme and pattern you prefer to create a unique look that is sure to showcase her school spirit and preppy style all together. Easter Sunday is just around the corner and is such fun to plan for. It brings us such hope and promise of new life in Spring. 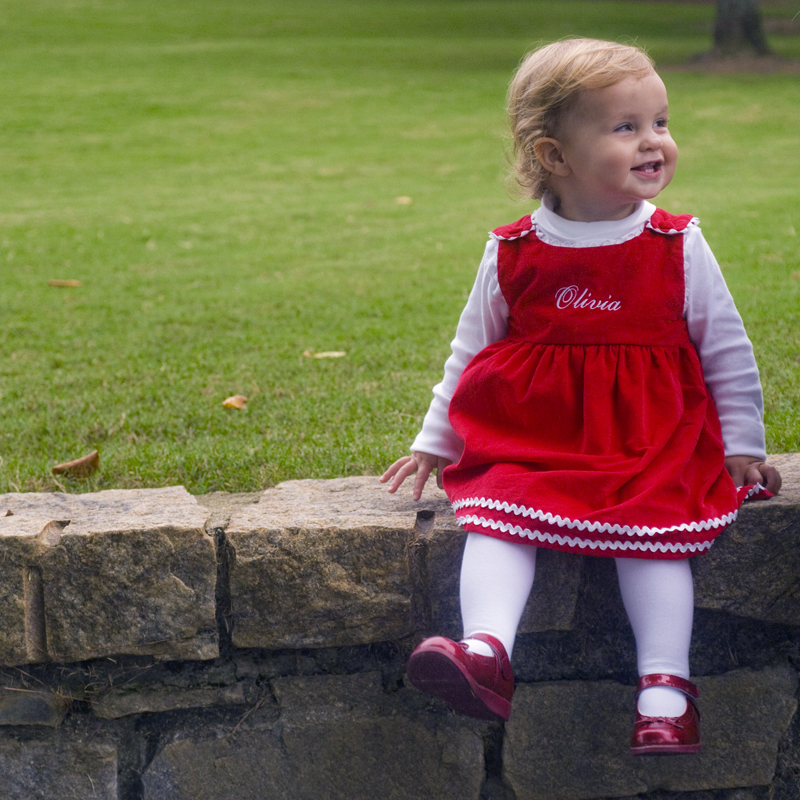 Little girls and big girls too love to dress up in classic monogrammed dresses for the big day! Shades of pink and green abound in clothing and in fabulously decorated Easter eggs. After a dress has been chosen for the big day, add a festive personalized Easter basket to her ensemble to complete the look. Choose from polka dot patterns, chevrons, and adorably preppy seersucker in yellow, lime green, pink or blue for a hue that will compliment any outfit. Embroidered with a child's name or initials, it is the perfect accent for filling with eggs at all those egg hunts, but the Easter Bunny will also love to fill these great looking buckets with chocolate and all kinds of goodies when he hops on by! 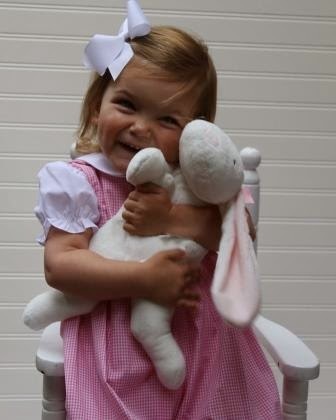 A very favorite and best selling item each Easter are our floppy embroidered ear stuffed bunny rabbits. 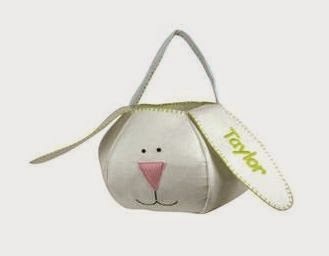 They have been long adored as a wonderful option for baby gifts in Nashville for years, but have since become well loved to receive in baskets for boys and girls alike on Easter morning. Since it marks the beginning of spring and a new season, why not add some fun warm weather accessories this year such as monogrammed flip flops and beach towels? Sure to be a favorite at the pool this summer, they will be ready with their swim gear fully personalized for a season of fun ahead. Classic children's clothing is the foundation of the preppy style. The Pink Giraffe specialized in bringing the best in monogrammed clothing for kids to you this season. Choose a ric rac trimmed dress for her complete with her initials, or a seersucker jon jon for him in a shade that will be fun to wear in the warm months ahead. Children's shoes with embroidered initials are a perfect addition to any classic outfit. Complete the look for little ones with a baby bonnet that can be personalized on the back for a gorgeous look. Sure to be a keepsake, our custom sun hats are treasured by families for generations to come. Letter writing as a tried and true art has sadly become scarce. We vote to bring back the beautiful calligraphy style lettering and engraved papers with some lovely monogrammed stationery or note cards. Exchanging mail through the post is an old school activity that a younger generation sadly is in need of learning. In this digital age, most children are relying on the use of email and social media for correspondence. In the current day and age of smart phones, tablet use and text messaging, it is extremely important that kids learn to write properly and just the right kind of stationery is they way to get started. Send your kids off to summer camp with their very own personalized stationery complete with a name printed at the top. They will be thrilled to write letters home all about their exciting adventures and fun days at sleep-away camp. Make writing letters with o with your child even easier with a self inking personalized return address stamp. There are so many designs to choose from to fit your personality. If you have a flair for all things nautical, choose the anchor design in the center of your name and address information. A monogram is a fun addition to a custom address stamp for that newly married couple. Speaking of newly married couples, a stamp for your return address is vital for mailing all those wedding mailings. Use them for everything from save the date mailings to the actual wedding invitation roll out. With so many colors of ink to choose from for each design option, the customized possibilities are endless. These custom stamps are a best selling housewarming gift and a old favorite for real estate agents to give to their clients and new homeowners or for friends who have just recently moved. They will be more than thrilled with such a unique and thoughtful gift that is sure to be used again and again. Getting married this year and need to find the perfect gift for your groomsmen? Choose something personalized and wonderful for the men in your wedding party! The Pink Giraffe has made it easy for you with a great list for you of our best selling favorites for monogrammed gifts for men. Maybe you just need to find something really fun and different for your husband, brother, father, boyfriend or uncle this year. 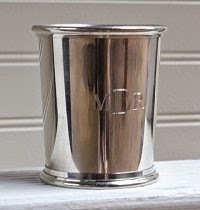 Engraved silver mint julep cups are a classic favorite and not just in Kentucky. These beautiful pewter cups can be personalized however you like with the date of a wedding day or graduation on one side and his initials on the opposite side. Julep cup are a beautiful and timeless choice for young men as they are great quality and will last for generations to come. He will love to show off his chic at the Kentucky Derby party every year, a picnic on the lawn or even just for keeping flowers around the house in style. 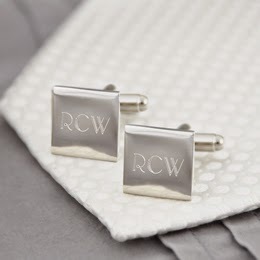 Monogrammed cuff links for guys are a great choice as well. Men of all ages are in need of a great pair of these classic little silver cuff links and why not engrave them with their monogram or last name initial? He will love them and will use them for years to come. Add a valet box or tray to keep all of his jewelry in one place. A silver engraved business card holder is an nice idea for the new graduate setting out into the corporate world to start his career. Silver is a favorite treasure for gifts for gentlemen. A monogrammed pocket watch is a classic tribute to the olden days. Engrave a lovely personalized silver pen with his three letter initials and he is all set to sign that next contract. Leather gifts for men such as monogrammed wallets stamped with letters are a traditional groomsmen or graduation gift. He will think of you every time he goes to use his wallet. A custom dopp kit in leather or canvas is a great way to keep up with travel toiletries on the go. A weekender duffle bag makes for easy travel in the days ahead. Embroidered with his name for easily finding your bag on the baggage claim at the airport. Football games and tailgates are fun in the fall so help him entertain in style with a personalized cooler bag or wine tote. He is sure to be glad to have a way to bring all the goodies to party. Embroidered stadium blankets are nice gift idea as well. Help him stay warm at those college ball games in the fall. Want a gift that is sure to wow the wine or liquor enthusiast? An engraved flask is a sure hit with that guy for sure. For the preppy guy on your list, don't forget the simply fabulous monogrammed needlepoint shoes for men. He can design his own pair in whatever colors he prefers to match all of his fun bow ties and seersucker pants. For the ultimate in preppy for men, our monogrammed seersucker cummerbund and bow tie set is a classic for prom, formals or for a wedding party for the groomsmen. It is such a timeless treasure and is likely to always be in style. The Pink Giraffe is an online boutique with lots of monogrammed goodies for all your gift needs. 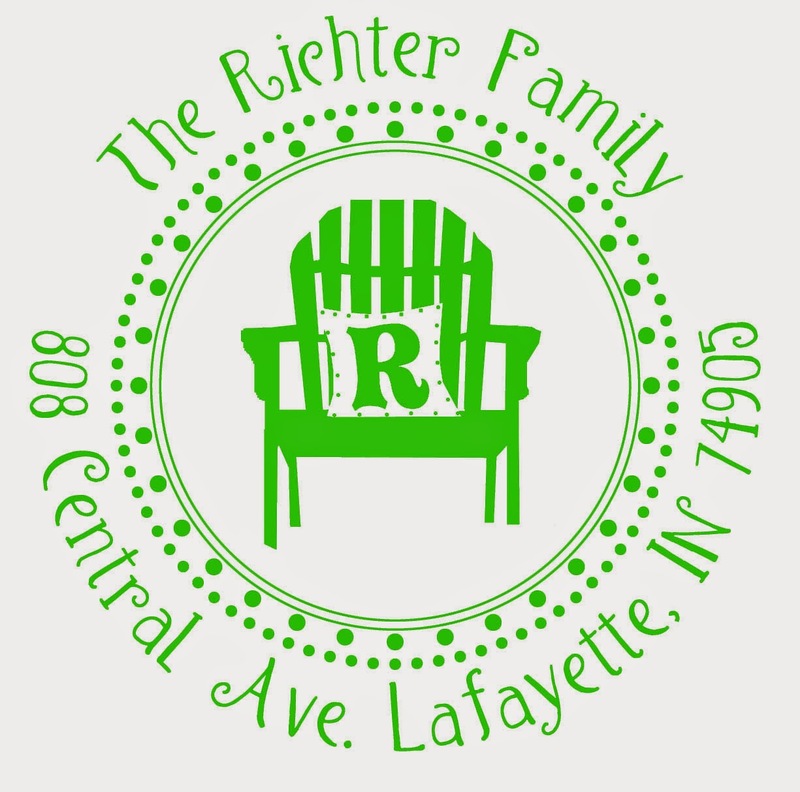 We sell unique personalized items you won't find everywhere else, Lamp Shades, scrapbooks, photo albums, sandals, clogs, baby gifts, and so much more. Check us out online!